Have you or someone you know benefited from our products? If you have any comments or feedback about our website or products, please let us know by filling out our below Feedback Form at the bottom of this page. I have been using the black african soap and a few varieties of the Shea Butter for several years. I've never come across anything that equals it. The soap is literally the only thing that I use in the shower from head to toe... even as a shampoo! Thanks for the great products! P.S. The miracle rub is also amazing. I have been going to a dermatologist for keratosis and after months and years of going a friend of mine gave me a bar of your soap. Since I have been using the soap my head has basically cleared up. I was left with one spot that would not clear up and return to my dermatologist who immediately asked me what I had been doing because it looks so good. I told her I was just wearing a hat like she instructed me to do but I owe it all to the black soap and will continue to use it. I love your soap and Shea Butter. I'm so glad I found your products! I bought the miracle rub gift set, with face wash and some essential oils from the craft show at Canterbury. I could not be happier!I like that there's no chemicals & that I can actually see at a glance whats in your product. My skin feels so silky, I use the face wash and mature facial serum every day. It keeps my skin clear, smooth, and smells so good. Running around without makeup is easy thanks to this. Miracle rub os great for congestion and to rub on temples. Thank you so much! You've got yourself a life long customer! I can't wait to see what other product you have. I can't wait to see you again next week in Fort Benton! I love the mature facial serum and the shea butter in almond! It's great on my dry, achy feet. I also use the Miracle Rub and perfume oil. I think I will purchase soap, too, next week. Thanks for your great products! I love every one of these products...especially the shea butter..I put this on my face every night and I can definitely see a diffference. Whenever I wear the Pendo perfume...I get so many compliments and asked where did I get it? People absolutely LOVE the smell and literally can't stop smelling it. It is a WONDERFUL product and love to support your company...for many reasons. THANKS! Thanks so much for these great products. I'm not sure if Missi told you, but she had lymphoma 3 1/2 years ago and as a result from the treatment, she has psoriasis. We have spent hundreds of dollars and seen several doctors trying to find something that would heal her hands and feet. Nothing has helped....until she started using both the Foaming Cleanser and Organic Soap. In one week, she noticed a significant difference. Her hands and feet have both cleared up completely! We are a believer! Her 14 year old son has noticed an amazing difference in his complexion since using the organic soap, too. I have had migraines for years and hate to take drugs, I've tried other products that are for pain but haven't had very good results. So I was skeptical as to whether the Miracle Rub would work but I thought it was worth a try. I am happy to say it is a miracle! Pain is gone within 10 minutes! THANK YOU so much for these great products. I am purchasing the Package as a gift and I am sure I will have other people who want to try it, too. I have given your website to several people to check out your products. I'm sure I'll see you at the craft fair in the fall. I purchased a kit for myself and a bar of soap for a friend when you were at the Angleton Market Days and I have never had a product that I like as well as this and have never shared my belief in a product like I have this product. I love all the products that I purchased and will be purchasing more. I made my first purchase when you were in Texas at Market Days. I purchased a kit which included the Soap, Shea Butter, Mature Serum, Liquid Soap, Miracle Rub, Lip Balm and Gloss. I would highly recommend all these products to anyone. I have never been as satisfied with a product as I am with this. I also purchased a soap for a friend who has a skin problem and she is very pleased. Have another friend that went to the Market Days and she purchased a kit for herself plus Acne Serum for her daughter. We have all talked about how quickly everything has cleared up and how good our skin feels. I have used the Miracle Rub for headaches, muscle pain, arthritis pain and cold and congestion. What I use to spend on different products to take care of all the different things that your products take care of I would have a a much larger bank account. I will be using this product for life, just wish I had found it sooner. I have spent thousands of dollars on skin care products and during a trip to the Arts and Crafts Fair I found Legend of Africa. I decided to try the shea butter soap. I started using the soap on my face and within a week the difference was amazing. Complexion was even, pores smaller, skin softer something that the $600.00 worth of products that I purchased the month before could not deliver. Recently I allowed myself to run out of my soap, purchased expensive "natural" products and my skin has suffered. I cannot wait until I receive my new order of soap and serum that I ordered. THANK YOU!!!!! After a coworker shared the Mircle Rub with me at work because I was conjested (and I immediately felt some releif I decided to look up the product). I found not only the rub but products claiming to help acne scars and acne which I've recently been battling because of hormonal changes, I ordered the Soap and Acne Serum. Not even a week and my skin is 80% clearer and so soft and amazingly even toned without make-up! I urge EVERYONE to try this...it just works! My young daughter's severely dry, itchy, bumpy, ashy skin wouldn't respond to anything....until we started using the soap and shea butter lotion. It has been about three weeks, and her skin is almost clear! She says it doesn't itch after bathtime anymore, either. I can't explain how grateful I am for your product. I just reordered. We purchased the gift set at the Minot craft show - all the products are wonderful (love the lip balm!!). I bought your package in Whitefish with your miracle rub about a month ago and I wanted to let you know one of the great healing of your miracle rub. The hornets and wasps have been especially bad this summer and my whole family and several relatives have been stung. If you catch the sting right after it happens the stinging and the redness and swelling goes away within 15 minutes. If you don't get to it until after it itches and swells it takes a bit longer. Great stuff! I ordered one for each member of the family. Thanks for finding this great healing rub!! Being it is cold and flu season , I have used up all of my Miricle Rub ..................... got the whole family applying it to the bottoms of their feet , put on socks , go to bed , awake in the morning feeling so much better !! We are addicted ! LOVE the soap and shea butter we got from you at the christmas show at the community center here in sturgis!!!!!!!! Definitely would recommend it to everyone!!!!! I met Cory this year at an art festival in Duluth, Mn. Not only am I very impressed with the products I purchased, I was deeply impressed with Cory as a person and his commitment to his passion, which is his company. Every single product I have tried, I love, love, love! I'm not even able to list a favorite! My top three are the Miracle rub, Mature Face Serum and the Pacific Lavender Shea butter. This will be the only source for my bath and body products from this day forward! I have been using your soap and Shea butter for 2 weeks now. LOVE IT!!! Getting rid of my proactive! The unrefined shea butter from is truly Grade A. I love the consistency, the way it smells and the fact that it is handmade vs factory made. I use it in my handmade soaps and souffles. Customer service is also Grade A. This is my place for unrefined Shea. Purchased your Mircle Rub at the Sweet Pea Festival here in Bozeman. My husband who has terrible sinuses cannot go a day without rubbing the Mircle Rub on his temples for relief from sinus pressure. Thanks again for a great product. I purchased the Organic Soap with Shea Butter this summer. The claim that it can help fade freckles, sun spots, etc... left me thinking "What the heck! Let's give it a shot!!" I had been carrying mine (sun spots) around for awhile and even acid peels barely touched them. Well, to my amazement... my sun spots have faded to probably 30% from where they were only 6 weeks ago. I actually noticed a difference within the first 2 weeks! If you are looking for a product that might help you with something similar, know that it has worked for my skin! I'm buying more and wanted to share my story! I have tried ALL of your wonderful products. I truely can not say enough about them! The mirical rub works wonderful ofr migrane headaches, the Mature face serum is the VERY BEST! I have tried almost every face cream on the market ( both expensive and cheap), but nothing comapres to this!! I have had dark circles around my eyes since I was 18 years old, after using the serum for a week, I no longer have the dark circles, The soap is also fantastic. Thank you for coming up with a product that REALLY does what it says it does! I'll NEVER buy anything else!!!! I have been using it for approximately 2 weeks and my bumpy "chicken" skin has disappeared from the back of my arms and across my shoulders. I am buying more. Thanks guys! This is a wonderful product. I just wanted to thank you and tell you how much we love the Shea butter . I can tell you honestly that I have searched high and low and have spent hundreds of dollars in search of the perfect lotion. I have found it ! My daughter was born with a rare liver disease that cause her it itch unbearably at times. needless to say her skin gets really damaged and dry. The Shea Butter is outstanding for her . The only lotion we use in our family. Thank you ! We got a few of your products at a craft fair you were at in Minot, ND. I have to say the miracle rub is AMAZING! My husband was the first to use it, as he has knee troubles, and I told him to try it and he reluctantly did. Boy within 10 minutes he was asking if we could order a CASE of it! It really does work well on aches and pains, and helps me with my insomnia as well! The lip balms are amazing as well! Thank you for such wonderful products! Legends Of Africa was at our winter fair here in Lewistown a few years ago. I had just started to experience frequent break outs with my pregnancy. I have never had very problamatic skin so I was pretty unfamiliar where to start as far as skin care goes. They sugggested their african soaps and I FELL IN LOVE! I have never found anything I like better. It truly cleared up my skin and I have yet to find anything I like better. The trust I have in that one produst has led me to try severel others from Legends of Africa and the story is the same for each. Hello. I know you are busy with the Pride of Dakota shows and am hoping those are going well for you. Just to let you know......your miracle rub is the only thing I have found to relieve my bursitis pain! I will be ordering more of that but am also wondering if you have an essential oils kit or just sell them seperately? I will place an order through your web site when I hear back about the oils. Thank -You. I purchased the Shea Butter about 2 years ago and it goes a long way. I have used it mainly on my cracked feet and elbows. What an improvement! I just reordered the Shea butter and the soap. I love the smell of Coconut Macaroon Shea. Thank you. I was at the Summer Celebration in Fort Benton when I saw your product and bought it. I have been using the soap and shea butter for over 3 months now. I melt some of the soap in a bottle with water and use for shampoo. I am so impressed with this. My hair was thin and fragile, breaking off easily. My hair now feel thicker and I seldom see a hair fall out. Also, I had two small warts on my head which have now disappeared. Also enjoy the shea butter and trying in all the different fragrances. Love your products. I love your products! I especially love the chap stick! My lips are always dry, so this is a great natural way to get my lips healthy!!! Thank You SSOOOO MUCH!!! I greatly enjoy your Men's Perfume Oils. I had used Black and Ismiyaki before. Upon reordering, I decided to order Bahari as well. So glad that I did. These are truly quite sensational. Thank you! I love all the products I have used so far, including the soap and the shea butter and the fahari perfume oil, but I really want to tell you how well the miracle rub actually works. I bought it thinking it might be nice for sore muscles...one day I had a terrible shin splint, and applied some miracle rub to it, not expecting much to really happen. Within an hour or two, my shin splint was GONE, and it hasn't come back! I really can't believe how well it works, but now I know that I will not be able to live without it in my house ever again! Thank you for having the very best products I have ever used!!! Just wanted to thank you ever so much for your products!!! I recently bought the soap, shea butter and the Miracle Rub. I normally do not comment or contact the people or companies unless i have a complaint. BUT here is the rare exception to my rule... Your products are amazing!!! You’ve made a long time customer out of me. Thank you again!!!!!! I started using your products and noticed a difference in my skin within 2 days! I have several issues that the shea butter has improved. My daughter-in-law was shocked at how well the miracle rub worked on her cramps. I have never had this much success with any other product! I am also impressed with and appreciate the information you provide on your site. Don’t stop doing what you’re doing! Your products are wonderful! "I saw your products at the Nebraska State Fair when my husband & I went. I take a lot of medications and they dry me out horribly; especially my heels! I have tried almost everything on my heels because they are so bad. My heels are so dry they crack and have ripped the bedding and the insides of my shoes. I go through a new pair of slippers about every two months just because the heels are worn out in them from my scaly heels! At the State Fair I purchased your 100% Premium Shea Butter and absolutely love it!! The first night I used it & I could tell a major difference on my heels when I got up. By the third day; after just using it at bedtime; I no longer have deep cracks in my heels that hurt! !I made a believer out of me and when I come close to running out I will purchase more so I do not run out!!! Would recommend it to anyone and everyone! Best money I ever spent! A million "Thanks"!! "I LOVE Legends of Africa! They always have something new to buy! I am in LOVE with the miracle rub and chap stick! They're jewelry is all so beautiful and unique- I always get a million compliments when I wear it! Everything is wonderful quality- it's truly the best! Thanks guys"! My Mom first gave me the organic soap to try because I have always had a problem with acne, and being 30 yrs old it gets a little disheartening and frustrating when you feel your face won't stop going through puberty. I was very nervous about it, being as how it has butter in it, but could not believe how well it works!! Great & Awesome product! I now order it myself and will be for a long time I'm sure! Thank you soooooo much for this line of products! I purchased your soap at the mall kiosk in Sioux Falls and it is truly amazing!!! When I was pregnant I had acne and this soap was the ONLY thing that helped clear up the breakouts without drying out my skin!! I LOVE the fact that it is a healthy/natural product and I would recommend this to everyone. Thanks!! "A true believer. I have been on numerous creams over the years for a wonderful skin fungus known as Tinea Versicolor. This condition made it so I sometimes dreaded going out of the house for days. My kids said I was part alligator that had scales of skin that flaked off. It was a real ego booster. That has now ended for the most part. My wife one day brought home this ball of brown putty and I hardly have outbreaks like I use to have. I use the organic african soap with each shower and it has changed my life. Thank you!" You HAVE GOT TO try this wonderful soap product! I noticed a difference the first time I used it instead of my usual facial cleanser. Your skin will feel soft and moisturized. All you need to do is wet your fingers and rub a little bit on the surface of the soap and it'll lather up nicely on your face. It's not a pretty soap, but it is wonderful! Guys should discover this stuff! It'd be great for their weathered skin." "I LOVE your Soap! I bought it at the Madison County Fair and have been in fear of running out before the next County Fair. Thankfully I knew someone at the Norfolk Daily News who did a front page story on you and got your name from them, as I'd misplaced your card. I'm so grateful to get to order more. This is the best soap ever!!!!" The organic african soap is amazing! My skin isn't dried out like when I use normal soap, and lotion isn't a necessity after a shower anymore. Plus, I haven’t broken out since I started using it...I would recommend it to anyone! Love the African Soap! Best thing that's ever happened to my face! 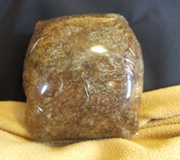 "I purchased your shea soap and miracle rub last summer at the fair in Sidney, Montana. I am so impressed with these products! I am anxious to try more of your products. I hope you'll be back at Sidney next summer! Will you be updating your trade show schedule so I can keep track of where you are? Thanks for your wonderful products!" "Hi! I purchased a jar of the shea butter and one of the soaps on Sat. at the EGF show. I was not sure about the soap but after trying it out I am amazed how wonderful it feels and it suds up so nice! I have always loved shea butter products but have never had any with this concentration! I will definitely buy more when needed! Thanks"! Have you or someone you know benefited from our products? If you have any comments or feedback about our website or products, please let us know by filling out our below Feedback Form. ** Please Note: Comments you post here about our website or products might eventually be posted above for other visitors to see. At the most, your first name, last initial, location and your comments will be posted. No other personal information will be shown.